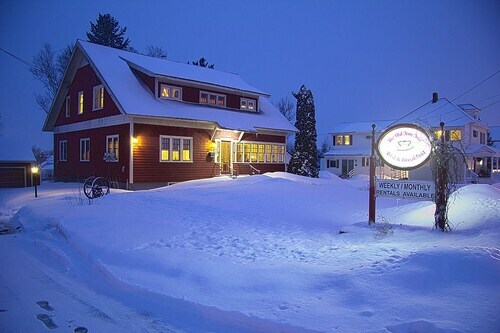 Located in the heart of Presque Isle, this hotel is 0.2 mi (0.4 km) from Aroostook Centre Mall and within 3 mi (5 km) of Northern Maine Community College and University of Maine at Presque Isle. Aroostook State Park is 7 mi (11.3 km) away. Situated in Presque Isle, this hotel is 0.2 mi (0.4 km) from University of Maine at Presque Isle and within 3 mi (5 km) of Northern Maine Community College and Aroostook Centre Mall. Aroostook State Park is 4.7 mi (7.6 km) away. Situated in Presque Isle, this hotel is 0.5 mi (0.8 km) from University of Maine at Presque Isle and within 3 mi (5 km) of Northern Maine Community College and Aroostook Centre Mall. Aroostook State Park is 4.6 mi (7.4 km) away. Situated in Presque Isle, this property is 2.2 mi (3.5 km) from Aroostook State Park and within 9 mi (15 km) of University of Maine at Presque Isle and Northern Maine Community College. Aroostook Centre Mall is 6.5 mi (10.4 km) away. How Much is a Hotel Room in Presque Isle? Hotels in Presque Isle start at $95 per night. Prices and availability subject to change. Additional terms may apply. Are you arranging to spend some time in Aroostook? Hoping to arrange a hotel in or around Presque Isle? Within a 6-mile (10-kilometer) radius of the Presque Isle CBD, you will find 2 comfortable hotels. Although Presque Isle can't lay claim to being home to a wide catalog of bases immediately within its urban center, Presque Isle Inn & Convention Center should be close enough to please Travelocity readers. You could also check out the Hampton Inn Presque Isle as well as the Caribou Inn & Convention Center. The Hampton Inn Presque Isle is only 2 miles (4 kilometers) from the main part of Presque Isle. The Caribou Inn & Convention Center, can be found 10 miles (17 kilometers) away. Alternatively, you may wish to book a room at the Presque Isle Inn & Convention Center or the Crown Park Inn. The nearest hotels in Aroostook include Houlton and Madawaska. Houlton is 40 miles (61 kilometers) to the south of Presque Isle, while Madawaska is 50 miles (79 kilometers) to the south. Travelocity-listed hotels in Houlton include the Ivey's Motor Lodge and Shiretown Inn & Suites. The Best Western Plus Edmundston Hotel and Comfort Inn Edmundston are some of the places to base yourself in Madawaska. Before you head to Presque Isle, why not explore Travelocity's Presque Isle city guide where you'll learn about all the scenic and cultural attractions to be found here. 1) Apparently the roof had leaked in numerous places from the heavy snow-load and MUCH work was being done to make repairs from water damage. 2) There was no elevator and because the hall-ways go around the outer walls of the building, rather than being located in the center of the building, we had to walk through MANY hall-ways to get to our room. 3) We stayed two nights -- the first morning the temperature of the water in the shower fluctuated between being tepid to extremely hot. The second morning the temperature of the water in the shower was only luke warm -- apparently many guests complained of this. 4) Although the picture on the TV was excellent, the audio was terrible. This was my first experience with staying in a B&B. It was great. The home was beautifully appointed with lovely antique furnishings and collectibles. Overall there was a warm and welcoming atmosphere. Our hosts were friendly and pleasant. Breakfast was way more substantial than we are used to at home. Amazing fresh warm muffins were starters. Everything was spotlessly clean and comfortable. The Old Iron B&B has definitely set the bar high for our next trip. They have been operating for 26 years and in our opinion, know how to satisfy their guests. Nice hotel .Easy to get to. The Bed was very comfortable. Room was clean. The staff very friendly and helpful, and the breakfast on both days was great. 3.0 Overall we were satisfied with our stay at the Crown Park Inn. Check in was very easy and quick. Staff very friendly. Front desk closed at midnight and all exterior doors were locked. We were disappointed that the hot tub advertised was not working. The lounge advertised with the hotel was closed and no longer in business. No Do not Disturb signs to put out on the door so when we went to have the free continental breakfast, the maid was in our room straightening up when we came back a few minutes later! Free continental breakfast was very limited, the bagels and cereal were stale and the orange juice had turned. The mattresses were old and uncomfortable for any longer than a two nights stay. The room was very clean, the shower did not have a water saving device-nice to take a shower like in the old days when we did not have to conserve-plenty of hot water too! !